It was the Canaan Planning Board that drew up the article establishing a Canaan Museum, which was adopted by the March 1961 Town Meeting. "To see if the Town will authorize the Selectmen to establish a Canaan Historical Museum on the second floor of the Town library and to appoint a Board of Curators who may solicit and accept contributions and donations for the same." 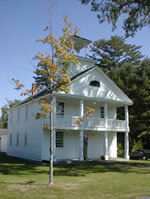 The Museum originated on the second floor of the Academy building on Canaan Street. It opened Saturday, August 19, 1961 with an exhibit of pictures, antique furniture and other items of historical significance. During the Bicentennial weekend more than 300 people attended the opening. Medora Nutter and Martha Stevens were Co-Chairman for the event. Others who were asked to be on the committee of curators were: Katherine Gordon, Pauline Barney, Constance Burbank, Margaret Eggleston, Karl Nyhus, Joseph Chandler, Col. Philip M. Whitney and Elsie G. Crocker. Elsie, a descendant of Canaan's second settler, Thomas Miner, was the first president of the newly formed association. Through the years many changes have taken place. 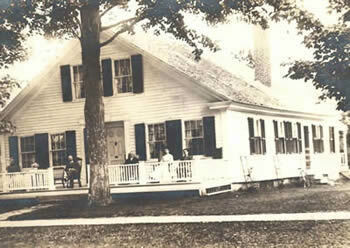 After the library relocated to Canaan Village in 1978, the Museum moved to its present location in Academy Hall. The building was closed in 1979 and again in the mid-1980's due to foundation work and other various repairs. When the organization celebrated its Grand Re-Opening, people gave freely of their family possessions to be displayed in the town's museum. As the Society's collection increased, it became, necessary, to renovate the old kitchen and back room of the Museum building for the much-needed space. The kitchen was used for years by the Ladies Church Aid on Canaan Street to prepare meals for Town Meeting, and numerous other events. This is now the Museum's History Room. The walls are filled with pictures, articles and, other tidbits of Canaan's past. The newly finished back room, which once housed a unique "three-holer", now contains old School desks that predate the Civil War. They were used in this building when it was known as Canaan Union Academy. The Museum also has the bells from the Canaan High School and Canaan Center School, the bench from the Canaan Railroad station, the movie projectors, used in the Town Hall Theatre, a century-old accordion owned by Hiram Blaisdell and a display of science equipment purchased in the 1850s at a cost of $850.00. These are only a few of the articles that comprise the Historical Society's outstanding collection of Canaan's memorabilia. Today, the Curators help to manage the holdings as well as solicit contributions of new exhibits and funding. 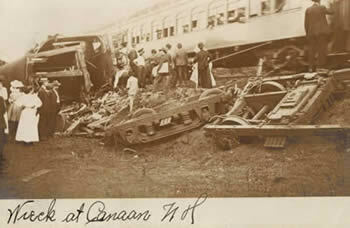 Be sure to visit the Heritage Link to find many more photos and resources on Canaan's History! 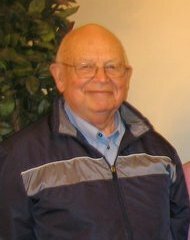 In 2012 Museum Curator Committee Member, Ann Wadsworth, sat down with Dan Fleetham, long-time Canaan resident, to collect some oral history. At the time of the interview, Dan was 100 years old and one of Canaan's oldest living residents. The following three stories were transcribed for us all to enjoy. In addition, sound files of the original interviews may be listened to by clicking on the audio links. 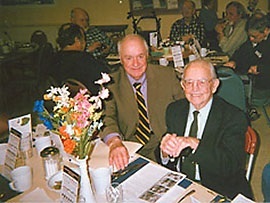 Dan at 100 receiving a commendation for still participating in the local Meals on Wheels Program. 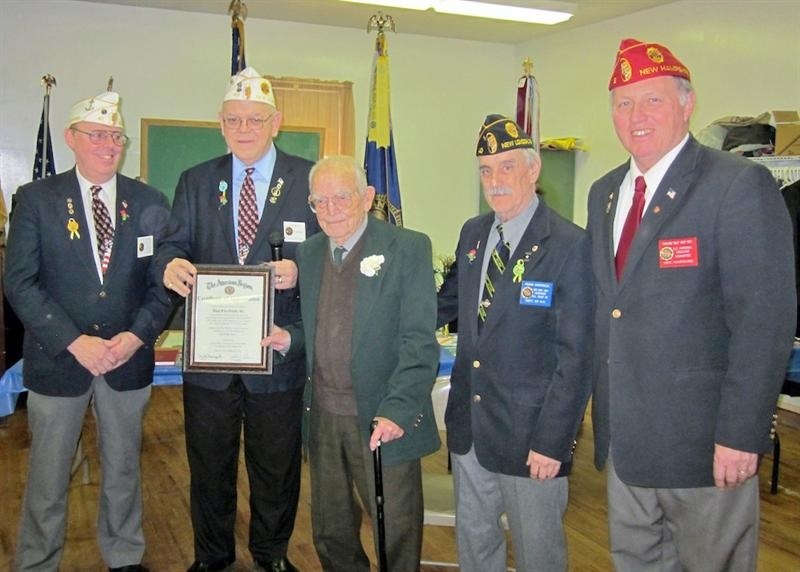 Dan Fleetham honored on his 100th birthday as a Legionnaire. "Teaching His Father to Drive"
"How Dan Became a Judge"
"The Judge and a Song from Bobbi Lynn Barney"
The Cobb House is mentioned in both the story of Dan's birth, and the story of how Dan became a judge. You can learn more at this Cobb House Link. The Pinnacle House is mentioned in Dan's story of his birth. Dan Fleetham and wife serving as the 1990 Old Home Days Marshals. In 2014, Ann Wadsworth had her tape recorder back out and was on the history trail again. This time, she caught up with Reginald "Reggie" Barney who grew up in the area, and also happens to be a train buff with many memories of the train service into Canaan. Below they share with us his memories in his own words. Do you have a memory of Canaan Life you would be willing to share? Have a suggestion of someone we should record? Please contact Sharon Duffy at sduffy@canaannh.org or 523-4501 ext. 108 to be put in contact with a Canaan Museum Curator! The museum is located on Canaan Street next to the Town Beach. 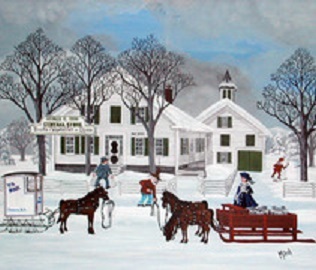 The Town Historian, Donna Dunkerton, can be reached at 603-523-7960.